Grace Lin follows up her 2010 Newbery Honor for Where the Mountains Meet the Moon with a 2011 Geisel Honor for Ling & Ting: Not Exactly the Same, showing she can write excellent books for beginning readers as well as novels for the older ones. “AHH-CHOOO!” goes Ting. SNIP go the scissors. If people thought they looked the same before their haircuts, they’ll make no mistake now that Ting has a chunk missing. Right in the front. 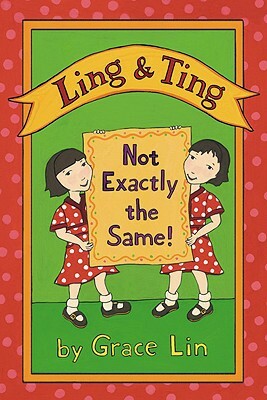 The book is divided into six short stories about Ling and Ting, and after the first one, Ting is always missing that chunk of hair. Next, Ling attempts a card trick. Then the sisters make their own dumplings, proving again that they are not exactly the same when one sister makes dump-Lings, while the other makes dump-Tings. Not even their chopstick ability is the same. It’s when Ting goes to the library that the fun really starts. Ting’s fairy tale book reminds her of something important: her card from Ling’s card trick back in the second story. The final story, entitled “Mixed Up,” then brings in parts of all the previous stories, as Ting makes up a story about two twin girls. Ling is sure she knows this story, and readers will be too, but Ting’s version will have readers laughing right up to the end.